For the last years I have seen many customers who lost their data because of the problem on their hosting company’s side. So I always recommend it is not a good idea fully rely on hosting’s backup processes. If you have a WordPress powered website, you can use a simple plugin which will backup your website to your Dropbox storage. So your data will be in cloud and secured from problems on your hosting or computer. Nice plugin called WordPress Backup to Dropbox can be installed via the WordPress administration interface and its Plugins section. After the installation you will find the new WPB2D item in the admin sidebar. Click it. At first, you have to authorize using this WordPress backup plugin with your Dropbox account. Click the Authorize button. The new window will open where you can authorize the access for the backup plugin. Now you can close the Dropbox window and reload the WPB2D page. As soon as you have authorized, you can check the default backup settings. These default settings say “backup my WordPress website to my Dropbox account every Thursday at midnight”. You can change this interval as you wish. You should know that the full backup of your WordPress site needs a database dump and file structure copy. WordPress Backup to Dropbox plugin does both of these backups. The database dump is backed up always, for the file structure you can check which folders should be excluded from the backup. 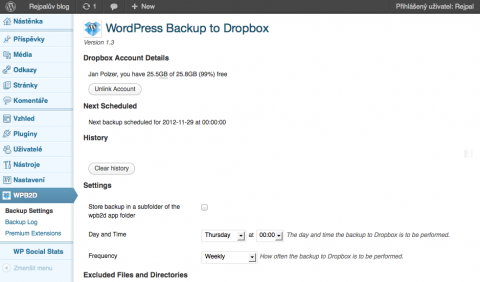 The basic functionality provided by the WordPress Backup to Dropbox plugin is completely free of charge. You can also see a Premium Extensions link. This will show you two advanced options – email notifications of the backup (for 9 USD) and Zip backup, which will compress your files before uploading them to the Dropbox for 19 USD. I recommend this for the bigger websites. 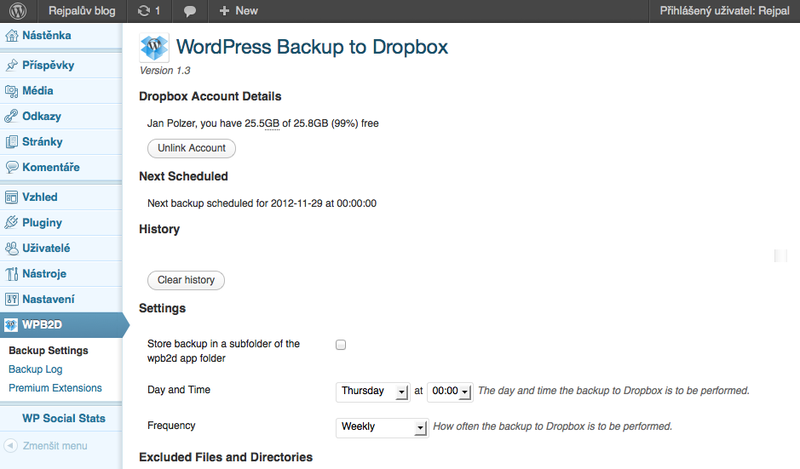 More information about WordPress Backup to Dropbox plugin can be found on its homepage wpb2d.com.